Chrome, the web browser application from Google, has a brilliant user interface feature that highlights vertical scroll bar to indicate the location of the words we searched for. The following screen grab is captured when I searched for word Microsoft using the built in Find option of Google Chrome. 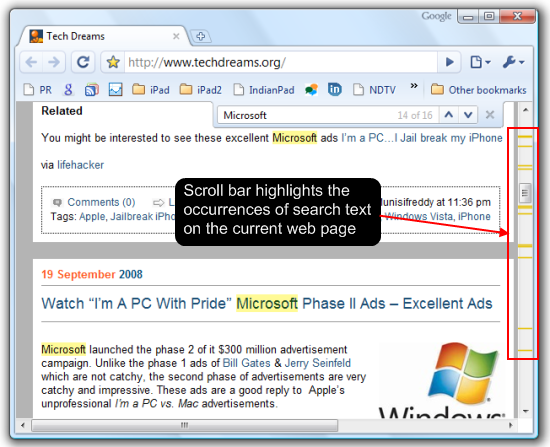 Apart from highlighting the word Microsoft in the visible portion of the web page, the vertical scroll bar indicates the occurrences of the word Microsoft in the rest of the web page. You can click on the Yellow colour indicators on the scroll bar to scroll to the line that contains the search term. when you do a search with chrome, it highlights all of the words on the screen a very light yellow. is there any way at all to change the color? it’s kind of hard to see when i just want to browse quickly. I’m with ‘dt’. I personally really want to start using Chrome… as it seems to open much quicker. However, I’m totally dependent on the google toolbar and its quick highlight features… and CTRL+F just isn’t cutting it. Sometimes I’m searching for words in a basic phrase, and I don’t know exactly how it will be worded, so I find it by seeing a clump of colors together on the page, as well, the ability to change one or two of these words on the fly is critical to my searching as well. I’d just really like to see the Google toolbar for chrome, that is, if they aren’t going to embed these features in chrome itself. Until they do, it won’t be like Firefox or the Google toolbar, where I take it upon myself to install it on every computer I run across (probably ends up being hundreds). No google toolbar; no chrome for me or anybody I cross paths with. How do I get it to highlight the searched-for words with a single click? In IE, I had the google toolbar. The words I had searched for appeared in the toolbar above the webpage. I only needed to click one of the words to see it highlighted. This takes longer, as I need to Control F, then type in again the words that I just typed in to google a few seconds ago, right? I must be missing something? yea g-chrome sounds pretty cool. i especially like the feature of how when 1 tab crashes, it wont close all the other tabs.